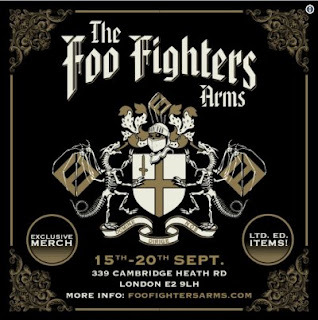 The Foo Fighters are opening a pub in London on Friday (September 15). The All My Life hitmakers took to Twitter on Monday to announce that the Foo Fighters Arms would be open for business for five days from Friday, the same day their album Concrete and Gold is released. They wrote "KEEP CALM AND COME ON" in the caption alongside a link to a special website for the pub and a poster advertising its location, in the Bethnal Green area of East London. The poster also included a logo image for their new establishment, which featured two dragon skeletons holding a coat of arms. Underneath, a banner displays the Latin phrase "Domine Dirige Nos", which means "Lord, guide us" in English. "Foo Fighters are proud to announce the opening of the Foo Fighters Arms in London for one week only," a message on the pub's website reads. "Doors will open to the public on 15th September to celebrate the release of their new album Concrete and Gold and will host a series of events for both fans and the general public. "There'll be Foo Fighters beers and exclusive merchandise on sale throughout the week. Keep an eye on the band's social media channels to find out more." An invite-only launch event is set to take place on Thursday before the doors open to the general public on Friday, when a release party for the album will take place. On 18 September, fans can win exclusives prizes in a Foo Fighters-themed pub quiz. The announcement comes shortly after frontman Dave Grohl told Metallica's Lars Ulrich on his Beats 1 show that they planned to record their album live in front of an audience at the Hollywood Bowl but PJ Harvey beat them to it. "Maybe eight months later (after they booked the Bowl show), PJ Harvey sort of did something similar where she set up a recording studio - I think it was an instalment in an art museum where you could come and watch," he said. "And I was like, 'That's sort of similar. Now I can't do that other thing.'"